alaTest hat 142 Testberichte und Kundenbewertungen für Panasonic KX-TGA410M zusammengefasst und analysiert. Im Durchschnitt wurde das Produkt mit 4.6/5 bewertet, verglichen mit einer durchschnittlichen Bewertung von 4.0/5 für andere Produkte in der Kategorie Schnurlose Telefone. Das Design und die Zuverlässigkeit bewerten die Testern positiv. Über das Preisleistungsverhältnis gibt es diverse Meinungen. Wir haben sowohl Nutzer- als auch Expertenbewertungen, Produktalter und weitere Faktoren ausgewertet. Im Vergleich zu anderen Produkte in der Kategorie Schnurlose Telefone erzielt Panasonic KX-TGA410M einen alaScore™ von 88/100 = Sehr gut. As always it arrived on time and the quality ofthe phone is great, no complaints here. Phone came quickly, was in excellent shape, and after charge, worked just as advertised. Very happy with this unit, and the whole process. Fit right in with other handsets! I bought this as an extra for the 2 other handsets that I already had. After charging overnite it synced right in with the others. I bought this handset to add to a 3 phone set I bought as an earlier purchase. This item intergrated into the system perfectly.So far (only had it for 2 months) the Panasonic phone has been an excellent buy.I would recomment it. Own the Base already and need another phone? I needed another extension for my Panasonic KXTG4132 phone system. Once I had it charged (which does take seven hours) all I had to do was press the correct button and it was linked up to the system - just what I needed. Buy one and you will see what I mean. 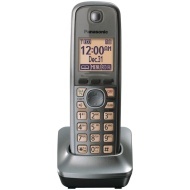 I really like Panasonic phones. Been buying them for years. Always lasted until i decided I wanted a new phone. I also purchased the base unit with answering machine and 4 handsets. It will support 6 handsets, so I purchased 2 extra handsets. They work great I highly recommend these for home use. They have plenty of features including talking caller ID.